Often we're asked what are the most popular packages by our customers. Believe it or not - they tend to vary from year to year. However, there are a couple of packages that year on year are always in the top five or ten which would include the likes of Surfing, Clay Pigeon Shooting and Funballs. There are also a few other packages that have become very popular over the last year. Here are five packages that come under the 'something different heading' that are well worth considering. 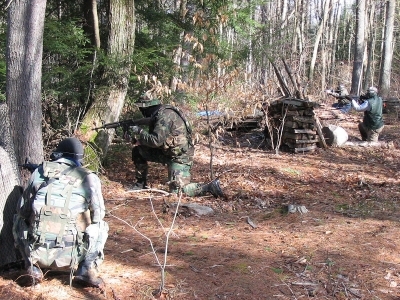 Airsoft is a great outdoor activty and similar to paintball. Its a military simulation sport but with hard plastic BB rounds instead of paintballs. This activity is an obvious choice for Stag parties. Coasteering adventures are unique and you will experience a great buzz as you clamber through old smugglers’ caves, spot incredible marine life, negotiate natural rapids and whirlpools before attempting adrenalin-fuelled sea cliff jumps. This activity takes place on an all-weather Professional Astro Bowling Pitch. There are several crazy games that really get the craic going. A great activity for the Summer. Something unique to Hen and Stag Sligo, this activity is great fun and includes a number of traditional Scottish games. The lead instructor Hutchie is a genuine stone-mad Scotsman himself. This is a great way to get the adrenaline pumping. You'll go on an action-packed river trip where you'll power through gorges, go over waterfalls and ride the rapids. This activity is a great start to any stag party.